We describe here a laboratory demonstration of the wind-driven circulation of the ocean and its western intensification manifested in boundary currents such as the Gulf Stream and the Kuroshio. The following three essential ingredients are required: (i) rotational constraints due to the spinning, spherical earth (ii) geometrical constraints due to the presence of coasts (iii) a representation of the action of the wind blowing over the ocean. We represent rotational and geometrical constraints by employing a square tank placed on a rotating table but with a false bottom which is tilted to represent (see theory section) spherical effects. The sides of the tank represent coasts. Winds are generated through the use of gently blowing fans, one to represent the westerly wind belt, another to represent the trade winds. Schematic diagram showing the sense of the wind-driven circulation in the interior and western boundary regions of subtropical gyres. 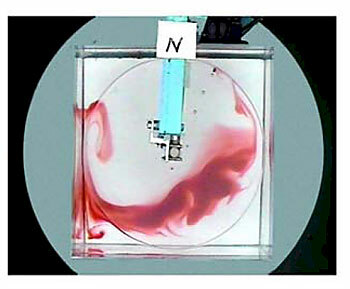 Dye revealing the sense of circulation in an ocean gyre experiment. The label ‘N’ marks the shallow end of the tank. The plume of dye drifts “equatorward” in the ‘Sverdrup’ interior. We see the dye being returned poleward in a western boundary current, the laboratory model’s analogue of the Gulf Stream or the Kuroshio. Equatorward flow is broad and gentle, poleward flow much swifter and confined to a western boundary current. In the experiment shown in the photograph, the action of the wind is represented by a rotating perspex disc.